Reggae, folk and rock lovers headed in masses to Marshfield, Massachusetts on July 7th, 2018, ready to enjoy a full weekend of music amongst friends old and new! 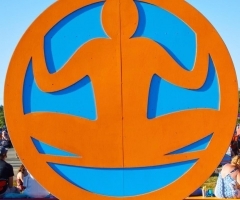 Marshfield is a quaint little town, tucked away in the wildnerness just adjacent to Cape Cod and nestled on the very most outskirts of the bigger Boston metropolis; naturally, Levitate Music and Arts Festival fits the bill. 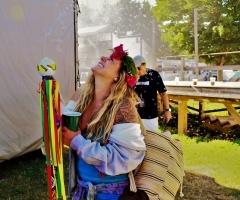 Back in its 6th year, Levitate has become known as the quintessential fest to turn on, tune in and drop out to the best jam bands in the business. And, what a weekend the 6th Annual was! As the Day One gates opened, hometown favorites The Elovaters took the stage to an already assembled crowd. People definitely rolled out of bed early for these cats! Brooklyn-based New Kingston had the honors of starting the side Soul Stage as The Suffers, all the way from Texas, took on the Main Stage energy. Ecclectic, electrifying and eccentric, Levitate was off to an epic start. The day progressed with Xavier Rudd's signature didgeridoo skills, Sam Fish's guitar shredding (in neon pink pumps, no less) and Ripe's 'Goon Squad' turning the party up to 11. There wasn't anybody having bad time at this point. Jumping from Ripe's dance party madness to Twiddle's mellow, yet momentuos performance over on the Style Stage almost defines the Levitate experience: this fest evokes every emotion, every sound, every wavelength. Robert Randolph and his Family Band got twangy on the Soul Stage before reggae-rock bellwethers Slightly Stoopid stole the show and got everyone singing. Stick Figure closed down the Style Stage, complete with cameo by Twiddle lead singer Mihali Savoulidis and, of course, Stick's canine sidekick Cocoa the Tour Dog, before Phish frontman Trey Anastasio came out to uproarious applause. People were waiting all day for the Phish-meister to melt their minds! Trey Anastasio Band jammed through the night, ending on a cathartic note as Trey hoisted his guitar high overhead, standing poised in pure music majesty. 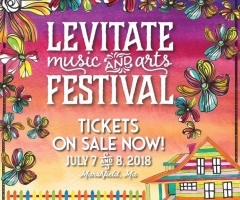 As everyone filtered out of the Marshfield Fairgrounds talking after parties while the night was young, Levitate attendees were stoked to have witnessed such unique performances with a whole other day ahead. See highlights of Day One above and stay tuned for the Top Shelf Reggae Day Two gallery to come.